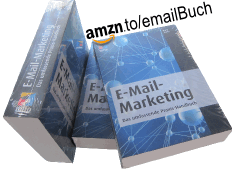 ← Did Hotmail unblock images? Among other things, comScore released new data concerning European internet usage by country, yesterday. They list the number of unique visitors per country in May 2012, their average internet hours, and the average page views per visitor. These numbers probably don’t translate into email marketing wisdom directly, e.g. in the form of “more online hours mean more email open rates”. Nevertheless, I couldn’t resist putting them into shape. The result may be another helpful piece in the mosaic of understanding European e-commerce (and email marketing) differences. The country colors and the face measures both represent market sizes, i.e. the number of unique visitors. E.g., the Russian Chernoff face is drawn slightly wider than the German pendant. This corresponds to 57.9 versus 52.7 MM visitors in May. The average time spent on the internet is mapped to the size of the eyes and the shape of the mouth. Internet is fun. Thus, a smiling face with a high mouth and popping eyes suggests that people “see” more online hours here than in for instance another country, were we meet small dot-like eyes and a sad mimic with a small curve-like mouth. Finally, the average number of page views per visit is represented by the size of the ear and the nose figures. Small ears (noses) mean, internet users “hear” (“smell“) only a few pages per visit. As a little help, I also printed the average hours and pages in red letters to the right of each Chernoff face. And a reference face with average values for all countries is shown in the legend left above. By looking at the map, it seems UK is far off concerning online time (biggest smile, biggest eyes). Over 39 hours have been measured for each visitor on average. That’s nearly a complete working week. 🙂 UK is followed by the Netherlands, whose people spend the second most time online. Germany and Russia, the countries which got most visitors, or internet users respectively (represented by the darkest blue), have rather average values concerning hours and pages. You can immediately spot that by comparing both faces (size, mouth, ears, and eyes) to the reference face at the top left. And data from Turkey to the bottom right suggest that people skim through more pages than in any other country – they got the most page views per visit (3.7). 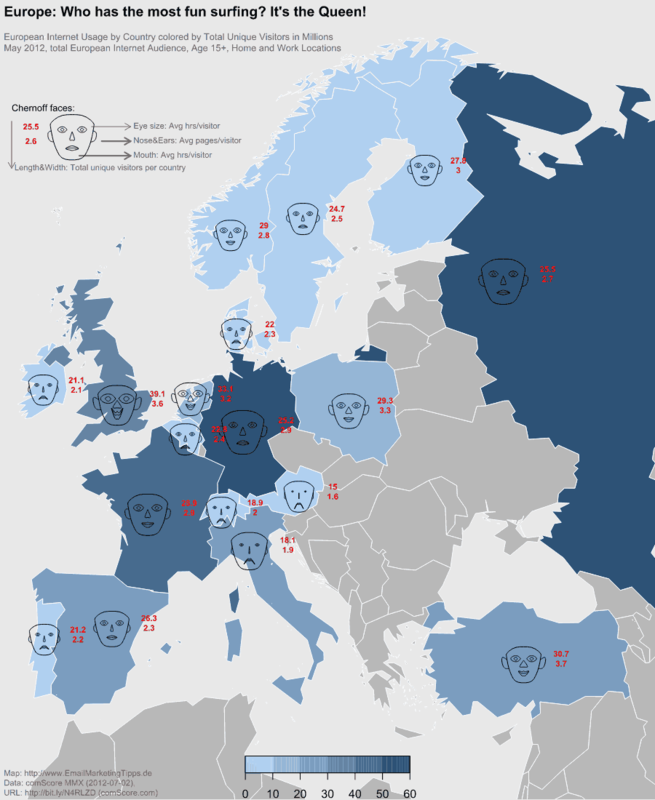 This is indicated by large nose and ear polygons in the Chernoff face. To prevent any misunderstandings: I know that Chernoff faces are a bit controversial in some points. It should be clear that I used this kind of visualization just to experiment with it and in the hope to make patterns better comparable. In particular I didn’t mean to make nationalistic or racial statements. I think I’d better deliberately point it out in advance as I’ve seen people flaming around on other websites before. It’s sad enough that I feel I have to mention it. The charm of Chernoff faces lies in people’s ability to evaluate facial expressions faster and easier than for example high-dimensional bubble plots, or even text tables. In addition, the facial mimics can represent a vast amount of different data attributes (hair, face shape, eyebrows…). What do you think of it – would you prefer classical bubble charts or is data better digestible using such faces? This entry was posted in english and tagged europe, stats. Bookmark the permalink. Without the bubble chart to compare, it is hard to say which is better, but I’d say the faces shown are visually engaging. So maybe for the analytical person they are not as good, but those who love the infographic explosion they will prefer this. Good effort!